With the competition season ending with the WOA Champs at the end of November, I was anticipating this HP news to be short. But with a report on the recent U23 Development Camp, plus a few other issues of interest, it seems to have expanded well beyond expectations!. So, holiday reading for all and see everyone again in 2018. Whereas most have probably been under the impression that the Oceania Championships every two years is an official IOF event in all grades, in fact the truth is that up until now all the regional championships (i.e. Oceania, North American, Asian, European) have only been officially in the elite grades. However, IOF are now extending this so that competition in M/W20E will be an official Junior Championships, and in Youth Championships will be contested in both M/W18 and M/W16. Although, in practise this will not make much difference, it will now formally recognize the winners of these classes as Oceania Champions. The WUOC2018 will be held in Finland from 17-21 July 2018. There are new eligibility rules this year which include a minimum age of 17 on 1 January 2018 and, perhaps more importantly for some, less than 25 years old on the same date (i.e. born between 01/01/1993 and the 31/12/2000). NZL is entitled to a maximum of 6 men and 6 women but only four of each can run in each of the long, middle and sprint, plus only 1 sprint relay team. Without implying any criticism to HBOC, one of the disappointments at the 2017 ONZ Champs to me was that none of the three individual events was a World Ranking Event. Had they been so, with the quality of the overseas athletes in the field there would have been significant World Ranking points to be gained by Kiwi athletes. With WRE’s again under discussion for the 2018 ONZ Champs it is worth looking at why, from a High Performance point of view, we might consider these to be important. There are essentially two reasons. Firstly, a WRE has to satisfy certain criteria set down by IOF. In doing so it means that we have events that meet the highest international standards and are run in the manner that our athletes encounter when they travel overseas to major events like JWOC and WOC. Secondly, World Rankings are important as at WOC and World Cup races they play a significant role in the start order, and no-one will argue that it’s much harder to get a good result when, with a low ranking, you are one of the first starters, racing alongside other low ranked runners rather than with the true elite. So why does there seem to be a reluctance to put on WRE events in New Zealand? The only reason seems to be a perception that mounting a WRE is a difficult thing to do. In reality that is a misconception. Although there are IOF criteria that have to be met, these are not onerous. So what are they? First, you need an IOF advisor – New Zealand has several people, spread around the country, who are qualified to fill this role, finding one prepared to act in this role for your event should not be a problem. Secondly, you need to publish bulletins, start lists and results in the appropriate fora. As the ONZ events person Russell Higham has this well in hand, and again it should not present difficulties. 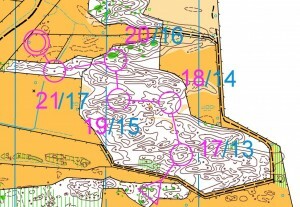 Perhaps more of an issue is that you have to comply with IOF mapping standards – unless you apply to IOF for a Rules Variation, long distance races have to use a scale of 1:15000, and middle distance 1:10000. Sprints can be either 1:4000 or 1:5000. A little bit of pre-planning and forethought will avoid any problems here. The final issue that seems to be raised is providing quarantine for the athletes. In fact quarantine is not obligatory but generally follows from the over-riding requirement of all orienteering events – fairness. In other words ensuring that no athlete can gain any knowledge about the course, or times that others are taking, means that competitors who have not yet started have to be isolated from anyone who can impart such information – be they fellow competitors or spectators. One way to expedite this is to put quarantine adjacent to the start and to start the WRE before any other classes. This minimizes the time for which quarantine is required. 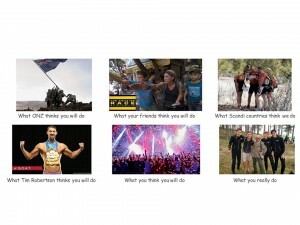 Which New Zealand events should consider WRE status? In terms of the second rationale above, it makes sense only to hold WRE’s when the fields are likely to be strong. This points to both the ONZ Champs, which should have the strongest domestic field plus a possible smattering of others, and to Queen’s Birthday when New Zealand hosts a Pinestars-Bushrangers test match. There are separate ranking lists for sprint and forest it a suitable compromise would be to have 1 sprint WRE and 2 forest WRE each year. Incidentally this was satisfied in 2017 by the Oceania Championships at Easter, which are WRE by default. Applications for WRE for 2019 are due with IOF in late September 2018 – so it is not too soon for hosts of major events in 2019 to be thinking about what they can offer to support the efforts of our elite. The Under 23 Development Camp started on Sunday 10 December with a mass exodus from Wellington airport, via Petone Pak ‘n’ Save, to Palmerston North, where in the meantime others had converged from Auckland, Hawkes Bay, Taranaki and elsewhere. Accommodation was spread around 11 units on PN Holiday Park, right behind the Esplanade and adjacent to the Manawatu River. Nick Hann led several of the men on a warm-up jog along the river, and after dinner (much delayed by the fact that the chicken drumsticks take a long time to defrost) Malcolm Ingham gave an introduction to the camp, explaining the rationale for what was promised to be a tough week of technical and physical training. Proceedings kicked off in earnest on Monday morning with the much dreaded 3000 m time trial at the Manawatu Community Track. Despite the fears it is fair to say that everyone gave this a good shot – for quite few this being the first time something like this had been attempted. Although there was a reasonably stiff breeze into the face along the home straight, and there were particularly impressive runs from Tommy Hayes, Cameron Tier and Joe Lynch among the men and Meghan Drew and Jenna Tidswell in the women. For the record, times, which now give a marker for improvement for each individual, were as shown. Men: Tommy Hayes 9-19, Cameron Tier 9-26, Joe Lynch 9-27, Devon Beckman 9-37, Cameron de L’Isle 9-39, Nick Hann 9-55, Kurtis Shuker 10-10, Oak Jones 10-12, Ryan Williams 10-20, Jonty Oram 10-21, Thomas Stolberger 10-22, Callum Hill 10-27, Stephen Harding 10-30, Jason Bond 10-34, Daniel Monckton 10-38, Felix Harrison 10-49, Max Griffiths 10-55, Ed Cory-Wright 10-57, Bayley Stephens-Ellison 11-19, Jimmy Hayes 11-57, Oliver Egan 12-05, Dominic Cleary 12-35. Women: Meghan Drew 12-02, Jenna Tidswell 12-21, Lara Molloy 12-31, Marina Comeskey 12-35, Heidi Stolberger 12-48, Katie Cory-Wright 12-57, Marisol Hunter 13-09, Eveline Husner 13-11, Ellena Caudwell 13-20, Carolyne Nel 13-26, Briana Steven 14-00, Sophie Harrison 14-25, Hayley Smith15-35. 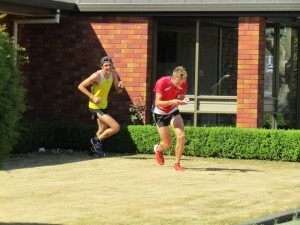 After a reasonably lengthy recovery period action moved to a series of sprint orienteering exercises on a new map encompassing Palmerston North Boys High School and Queen Elizabeth College. 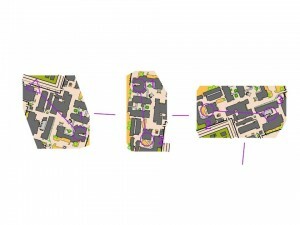 The first exercise emphasised map orientation and contact by presenting a series of disconnected and randomly oriented windows to be navigated through. The nature of this makes reading and planning ahead very difficult, and puts a premium on feature recognition and quick decision making. The second exercise was done in pairs with a single map per pair. This required one person to navigate to control 1 and then hand the map over to his/her partner who has to both relocated and plan the next leg as fast as possible. Subsequent legs are alternated. The afternoon finished with a short 3 person sprint relay, won by a team of Cameron de, Daniel, and Briana. In the evening Nick Hann gave a presentation on, from his perspective, what JWOC and WOC are really like. Nick’s wry sense of humour came through in his very opening slide – a tongue in cheek view of different expectations at JWOC. For a small number of attendees who attended a Wellington training camp two years ago, day 2 will have given a sense of deja-vu. Once again, due to fire risk, the public gate on Fusilier road was closed and there was 2 km walk into the map (and back out again) with the sun beating down. Not to be deterred there were exercises undertaken. These started with a pairs relocation exercise and continued with a windows course requiring accurate compass work and pacing, as well as recognition of the terrain when entering a window close to the control circle. 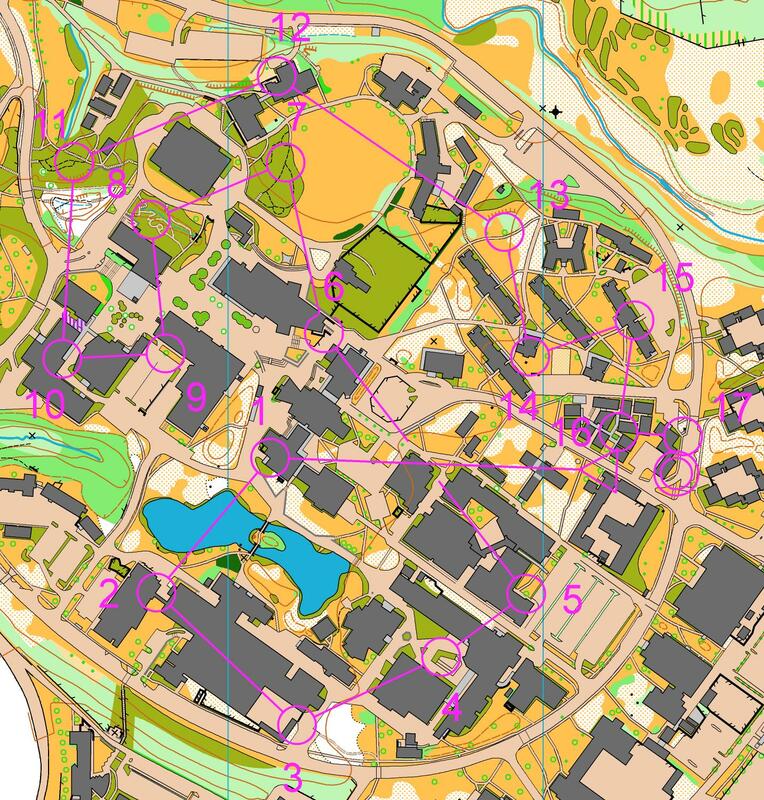 The final exercise was a series of three mass start orienteering intervals complete with splits to simulate the start of a relay. Participants were set off in 3 different groups with the first to finish each interval given 10 points, 2nd 9 points, etc. giving a maximum of 30. Scoring was a bit chaotic, with an estimate of ±3. Perhaps the only clear result was that in the women Lara came in first in each interval to score 30 points, while Cameron de scored two 10’s in one of the men’s groups. On the initiative of Tom Reynolds, a member of the IOF Medical Commission, on Tuesday evening we were treated to a talk by Tracy Ward, from Drug Free Sport NZs education division, on everything that our athletes need to know about the responsibilities and dangers with respect to prohibited substances and supplements. From the reaction this was obviously a sobering eye-opener to most. We are extremely grateful to Tom for helping to arrange this. Scotts’ Ferry was first used for the ONZ Championships in 1988, has since been clear felled, and is now, or at least part of it is, in its second life. This was the venue for Wednesday. Again, the first two exercises were pretty well a re-run of exercises used at the Wellington camp in January (see January 2017 HP News). The first was again a pairs relocation exercise through complex sand-dunes with each member of a pair only having either the even or odd numbered controls on their map and having to follow their partner to the others before taking over. Following this was the (in)famous interval session designed to force navigation under extreme physical pressure. 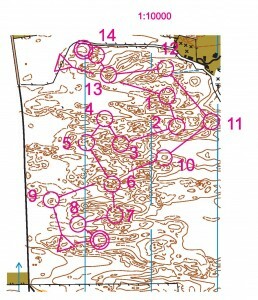 Thus, after an approximately 400 m interval along a track, athletes immediately went into a 4 control loop in the technical forest. This was followed by a 5 minute break before the next interval, with a total of 4 such intervals in all. This was by far the hardest session of the week and was followed by a long lunch break, before a short, but difficult corridor exercise, and a 3.2 km standard course. 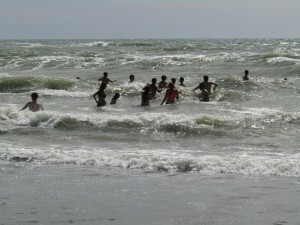 The afternoon finished with a visit to the beach at the end of the road and a dip in the churning waters. Wednesday finished with a talk by Jean Cory-Wright on physiology, emphasising the different energy sources within muscles, their inter-relationship, and how the body responds to different levels of intensity of exercise. 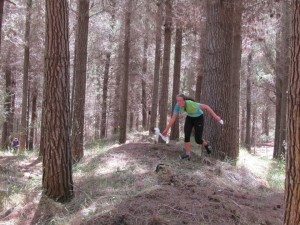 Thursday was fully based in Palmerston North and started with a hill run in Arapuke Forest Park. Athletes split into 3 groups, tackling different runs. 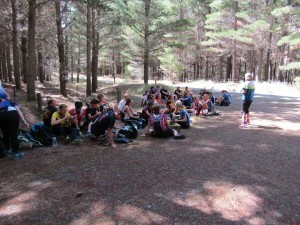 Most started with the 4 km uphill run on Back Track, with some then descending back to the carpark by the direct route (45-50 minutes), while many of the men extended things by about 20 minutes by going east along the ridge through the mountain bike park before descending and returning along the Sledge Track. An intrepid 9, led by Nick, went out along the Sledge Track before ascending to the northern slopes of the Kahutara valley and taking a look at the old platinum mines on the plateau above – meandering 2 hours plus. Once again there was a swimming break in the river before returning to Palmerston North. Many then took advantage of the proximity of the Manawatu Aquatic Centre before reconvening for a second sprint relay, on The Esplanade. 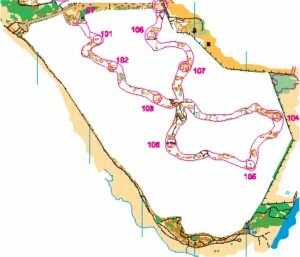 This area of parkland and native bush is riddled with tracks that allow for excellent route choice options, something that is a standard in a sprint relay. 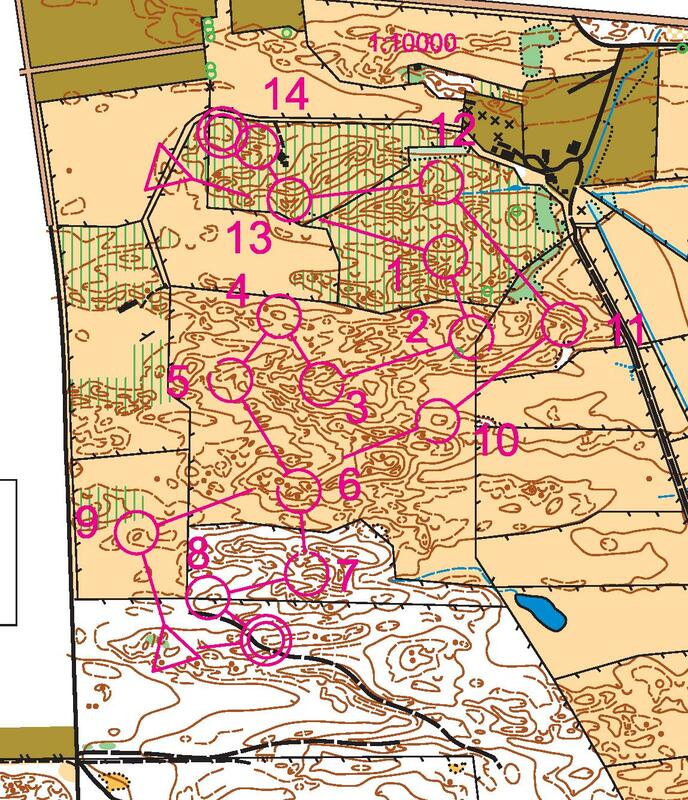 Despite the best efforts of PNCC to wipe out control sites by extending the bird cages in the middle of the map (close to #3) this proved to be a hotly contested relay. 1. Katie (14:47), Jason (12:32), Ed (12:12) 39:31; 2. Heidi (14:21), Thomas (13:49), Daniel (12:55) 40:46; 3. Ellena (16:03), Jonty (13:16), Joe (11:49) 41:08; 4. Jena (15:16), Lara (14:49), Nick (11:11) 41:16, 5. Briana (15:53), Dominic (14:24), Tommy (11:05) 41:22; 6. Carolyne (15:23), Kieran (13:24), Kurtis (13:02) 41:29; 7. Eveline (16:03), Oliver (13:38), Cameron de (12:00) 42:15; 8. Hayley (18:12), Oak (13:04), Cameron T (11:19) 42:35; 9. Marisol (15:50), Bayley (14:05), Richard (15:15) 45:10; 10. Sophie (20:18), Felix (13:34), Devon (11:37) 45:29; 11. Meghan (15:33), Jimmy (16:02), Callum (14:33) 46:08; 12. Marina (16:38), Ryan (13:49), Stephen (16:13) 46:40. The evening session, on developing a training programme with the objective of JWOC/WUOC/WOC, was given by Malcolm. 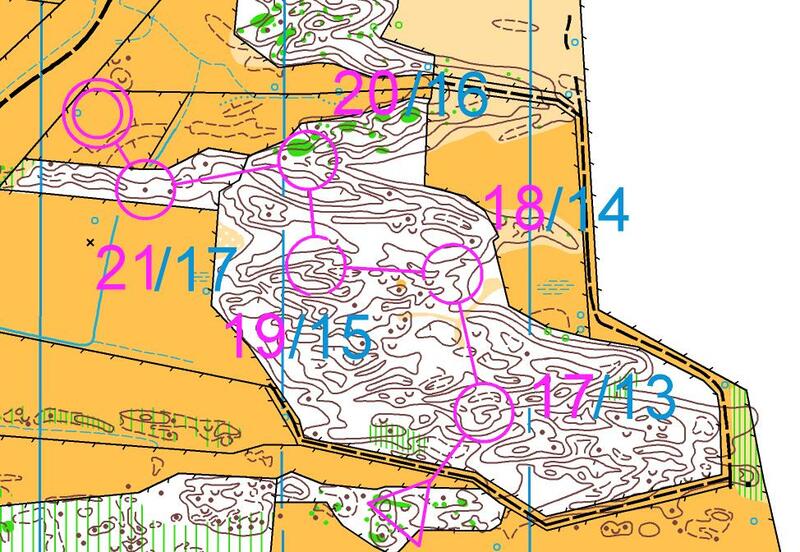 The terrain in store for JWOC2018 in Hungary appears to feature considerable open areas with much scattered vegetation. 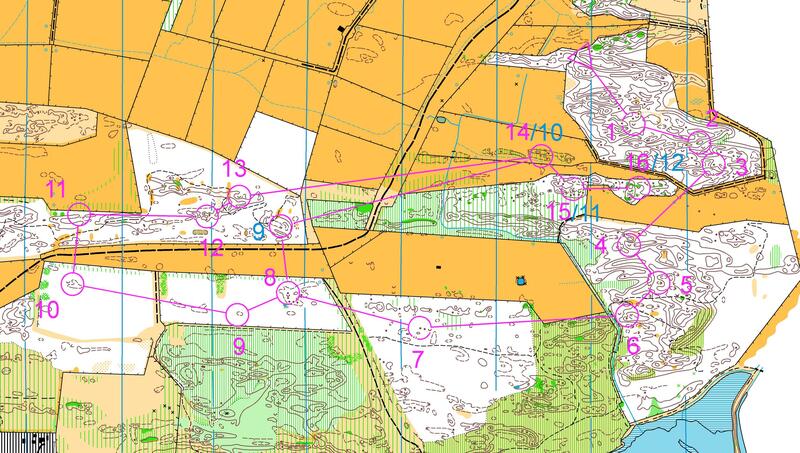 The first exercise on Friday, at Prickly Sands, was an attempt to mimic the type of navigation likely to be important in such terrain – ignoring most of the vegetation and navigating largely on the contour detail. 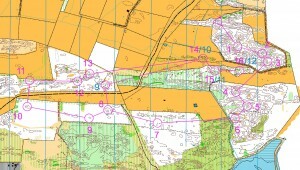 Thus two O intervals on a contour only map were on the menu. Despite the heat, for the fifth day in a row, and several prickles from the boxthorn, this attempt to foreshadow JWOC2018 seemed to be appreciated. 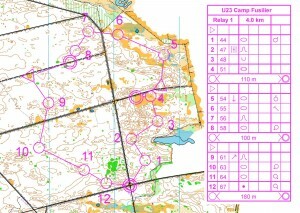 The following, and final, exercise before the camp champs was a short (~ 2.5k) mass start, with splits, on the north end of Hydrabad. 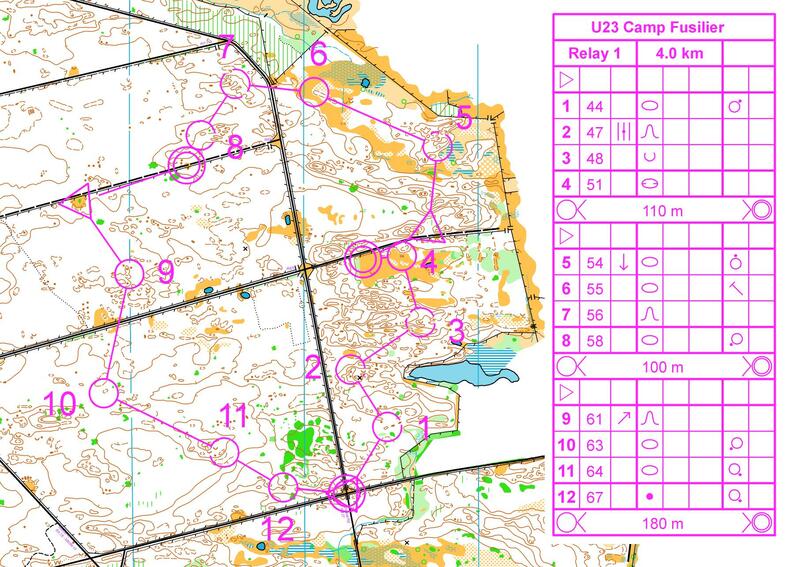 Including the two sprint relays and the O-intervals on Fusilier, this was the fourth mass start exercise of the week. These were intended both to encourage a faster pace and to try and provide experience of running under pressure from others. Despite tired legs the pace at which 30+ runners took off was testament to the success of the first of these objectives! Once again, while controls were put out for the camp champs there followed an interlude on the beach at Waitarere. 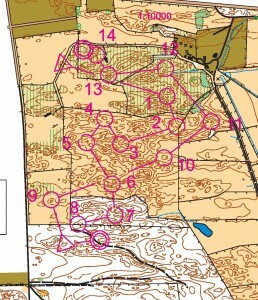 The camp champs on Kaikokopu were planned as a middle distance. Although Kaikokopu has now been around since the ONZ Champs in 1997 there are still parts of it that have been little used. These include an area in the north-east corner of the map which was originally rough open but is now complex, relatively low visibility forest. This was used both for the first and last few legs. Courses were 5.1 k for the men and 3.9 for the women. In the men’s race there was fierce competition with the top 3 (Nick, Kurtis and Joe) covered by only 20 seconds. In the women the top 2 (Carolyne and Eveline) were also only 14 seconds apart. Men: 1. Nick 30:31, 2. Kurtis 30:43, 3. Joe 30:52, 4. Cameron d L 32;33, 5. Callum 33:50, 6. Devon 34:45, 7. Cameron T 34;57, 8. Tommy 34;59, 9. Jason 35:07, 10. Ed 35:24, 11. Jonty 36:07, 12. Ryan 37:07, 13. Daniel 41:24, 14. Bayley 42:22, 15. Kieran 42:30, 16. Thomas 43:01, 17.Oliver 43:48, 18. Oak 44:06, 19. Felix 45:01, 20. Jimmy 51:47, 21. Stephen 54:16, 22. Dominic 54:39. Women: 1. Carolyne 36:54, 2. Eveline 37:06, 3. Katie 38:05, 4. Jenna 39:02, 5. Marina 40;36, 6. Meghan 40:46, 7. Sarah 41:43, 8. Heidi 43:43, 9. Briana 45;25, 10. Ellena 45:47, 11. Sophie 48:10, 12. Hayley 50:26. After a final wrap-up discussion on Friday night, the last act of the camp was the sprint champs on Saturday morning on the Massey University campus. This area has been well used over the years but still presents an excellent venue for a challenging sprint. 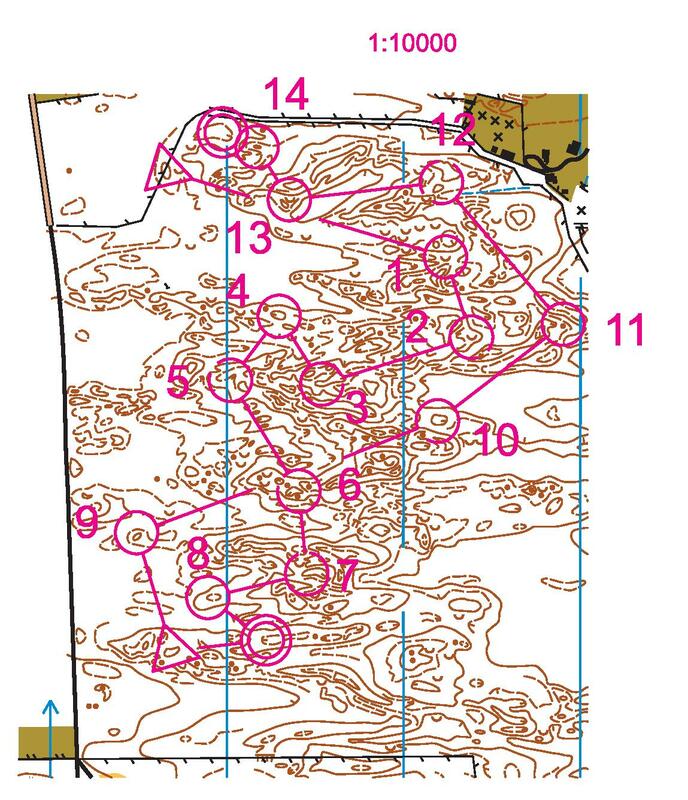 In this case the mens’ course 9correctly measured around impassable objects) was 3.3k with the women having 3.0k. Once again Nick and Carolyne came out on top, Nick holding out Tommy by 16 seconds, with another 14 over Cameron d L, while Carolyne had nearly half a minute over Jenna, who pipped Katie by 3 seconds. For some, however, the highlight was surely Ed’s wonderful impersonation, as his sister stood on the start line, of a Blair Trewin commentary! Women: 1. Carolyne 15:56, 2. Jenna 16:23, 3. Katie 16:26, 4. Meghan 16:38, 5. Marisol 17:07, 6. Eveline 17:48, 7. Briana 17:57, 8. Sarah 18:00, 9. Marina 18:23, 10. Ellena 18:32, 11. Heidi 18:34, 12. Sophie 18:57, 13. Hayley 19:23. Overall a very full week which included roughly 10 k of sprint orienteering, 32 k of forest orienteering, about 9-15 k on track/trail/hill, 4 swims ( 2 in the sea, 1 in a river and 1 in the aquatic centre), warm-ups and cool-downs, and 5 talks. 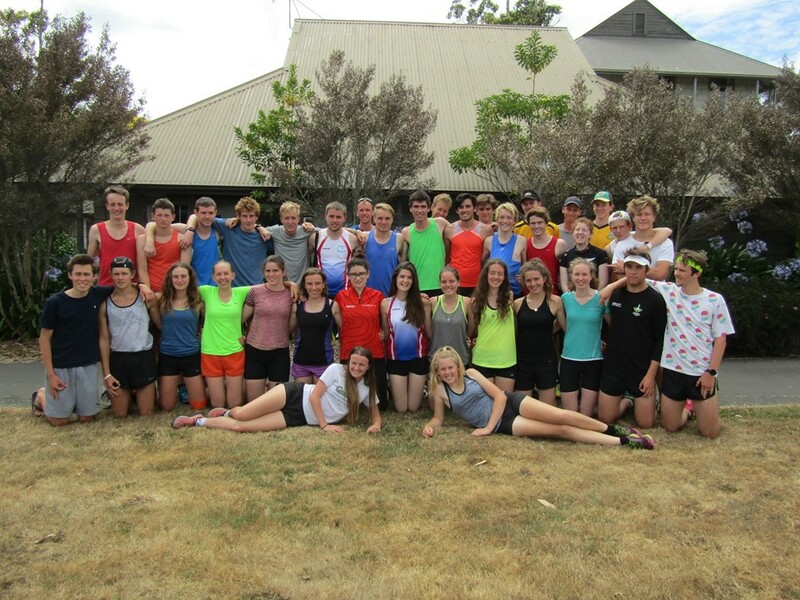 Thanks to Jean Cory-Wright, Richard Greatrex, Nick Hann, Kieran Woods and Sarah O’Sullivan for their organizational help, well done to all 35 athletes who stuck the tough week, and a grateful acknowledgement to the Pelorus Trust for generous support. Congratulations to Gene Beveridge on his 3rd place (2nd Open Man) in the Kepler Challenge on the first Saturday in December. Gene’s time was 5:11:42 for the 60 k loop. Not quite half an hour behind in 11th place overall and 8th Open Man was Tane Cambridge in 5:39:53. 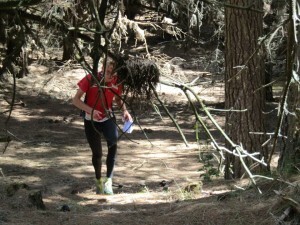 The same weekend there was a strong contingent of U23 orienteers at The Goat on the slopes of Mount Ruapehu, and they more or less cleaned up the Junior Men’s race. Congratulations to Calum Sutherland 2nd overall (1st Junior) in 2:03:32, Oak Jones (4th, 2nd, 2:06:48), Jason Bond (8t, 4th, 2:14:32) and Jonty Oram (19th, 6th, 2:27:14). The last 3 of these were clearly training for the U23 Development camp the following week. 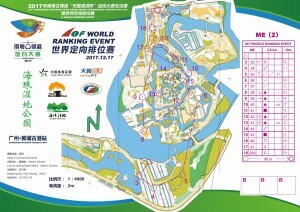 Meanwhile Tim Robertson has been back in China running in the Park World Tour, or more specifically the Guangdong Historical Road Orienteering Championship. Tim’s results improved through the four race series going from 4th to 3rd to 2nd to winning the final race. The races included WRE in both middle distance and sprint, with the map for the later shown above. The first round of the 2018 SuperSeries is rapidly approaching. Entry to the event overall are limited to 250 so make sure you enter early at https://sow.nz/.